One wasn't good enough so we made two poke bowls for you and this Poke Bowl Recipe is both Matthews and my favorite of the two. We love the delicateness of the salmon and the way it absorbs the marinade. It also the closer of the two to resembling sushi! If you are even the slightest bit interested you should watch Matt put both bowls together with ease and give you some great tips along the way! So what do we love about salmon aside from how delicate it is and how perfectly it carries flavor due to how penetrable it is? Well, it's a great source of protein and fat, not to mention it is high in B vitamins, potassium and omega 3 fatty acids. All necessary on a ketogenic diet! The ways to prepare it is also endless and we always change it up when we cook with it. You can bake it, fry it, saute it, or eat it raw. It's also pairs well with most sauces, from pesto to lemon pepper! Lately we've been making a recipe and realizing that there are so many great variations that can be made on the same recipe and we find it our duty to share those variations. So when embarking on a poke bowl recipe, which was Matt's idea by the way, we knew we couldn't just do one. We did not want to deprive you of those joys of what can be done with a poke bowl so we also created a Ahi Poke Bowl! Salmon and tuna differ highly is taste, texture and how they can be prepared. You have to try both to truly understand! Knowing just how delicate fish is is very important when handling it. You don't ever want to go in with a dull knife and just butcher it, and that really goes for most meat, but fish in particular! I'm sure you've seen at least one scene on TV where Gordon Ramsey is humiliating someone in response to the way they butchered a large piece of fish! Well, we didn't want to be that someone so we were so kindly sent the most beautiful knives we'd ever seen to be used in this recipe - the Kanpeki Knife Set over at Kamikoto - and boy, did we use them! We also fell in love all over again after handling them. Yes, they are pricey, and no we didn't pay for them, but boy do we love them like our own babies! 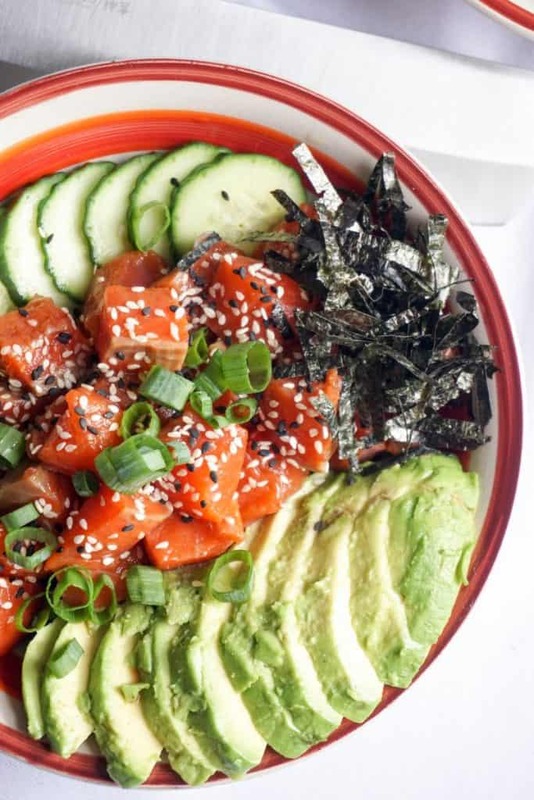 Recipe can be quickly added to MyFitnessPal - Search "KetoConnect - Poke Bowl Recipe"
Combine marinade in a bowl and add bite sized pieces of salmon to the marinade, combining well. Refrigerate salmon for 2 hours. Place cabbage into a bowl and add sesame oil and rice wine vinegar and toss. Add sliced up cucumber, and avocado, and add marinated salmon. Sprinkle with scallions, sesame seeds and chopped up nori.